Last night Dwight Howard thought he was going to sit another game for the Lakers, but little did he know he was going to be a large part of the Lakers win against the Cleveland Cavaliers. Howard end the game with 22 points and 14 boards has the Lakers end a history long losing streak of 6 games. 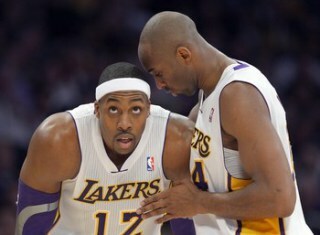 Howard was out for three games with his shoulder and he comes back and helps the Lakers win 113-93 Sunday night. Kobe Bryant had 23 points and also helped end a losing streak. Steve Nash had 10 points and 9 assist. The Lakers play better defense when Dwight Howard is in the game. Howard just wants to sting some wins for the team and they got a victory last night. The Cavaliers are ahead of the Wizards for the worst record in the NBA with a season record of 9-30 and the Wizards have a 6-28 record.